No business advice in this one - just a personal vacation update. Elizabeth and I are just back from a canoe trip. So exhausted and rested at the same time. And sore. Or if there is advice, it would be to take time to reflect. Fast company did an article on taking time to reflect to improve productivity. Perhaps that is the message. I feel the pressure of email, responsiveness, projects etc that were on hold for almost 2 weeks while I was out of touch. I am hoping the value of the reflection time sticks despite the return to real life. The Canadian shield is just beautiful. There is no place more tranquil. Awesome. I had spoken to a few people unfamiliar with canoe tripping so thought I would give a basic FAQ. Our days tend to be short. A long day is only 7 hours by the time you pack up, stop for lunch and set up camp again. In 7 hours, you can cover about 20K (12.4 miles). If it was all no wind, flat water, you could do 30K. But the days are punctuated with portages. And a 1 K portage takes an hour. With a topographical map and compass. We do not take a GPS but some people do. We do not strictly plan where we will stay. We see how tired we are and how nice the lake looks. We eat well. All just grocery food but dry stuff like lentils, soup mix, pasta etc. We dried some of our own vegetables which are a real treat. We cook on a white gas whispertlite stove and take a stick stove for backup. Usually we augment this with blueberries but it was so dry this year that they were all gone. A few raspberries (very sweet by comparison to blueberries). And of course fish almost every day for breakfast, or lunch or dinner. Granola is a staple for breakfast. And it has the advantage of not needing cooking so can be eaten as lunch or dinner in a pinch. Some people say 6,000 but with the short days we do, I think we only burn perhaps 4-5,000. So for extra calories, we make instant pudding/mouse. And we take high calorie snacks - dried fruit, nuts, sesame snaps. Up at perhaps 6:30. Fish until 7:30. Breakfast. Roll the sleeping pads, stuff the sleeping bags, pack everything. The early mornings are precious times. 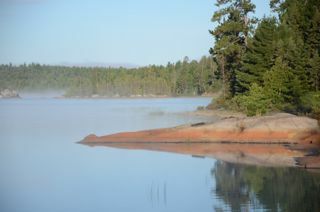 The fishing is good and the water is still and often misty. If there is a drawback, it is cold so the temptation is to stay in the sleeping bag. It was about 45 degrees F in the mornings. 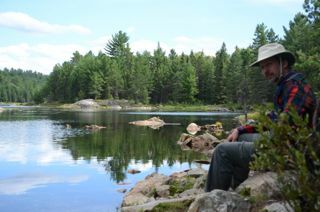 Still water is also best for canoeing - especially bigger lakes where wind later in the day can make them tougher. Paddle for a couple of hours. Paddling is punctuated by portages. Stop for lunch. On days we set out early, sometimes fish again. The problem is catching, cleaning and cooking a fish is time consuming. So lunch with fish takes 90 minutes. The back on the water for a while. Then set up camp. Fish. Then dinner. How often do you see people? Most days, we saw a couple of other trippers. At nights, we never shared a lake with any other trippers. In previous trips we have been as long as 8 days without seeing anyone but this year, there was more activity. How heavy is the gear for portaging? It feels heavy but it is not. Packs weigh about 50 and 35 pounds. Food pack (stored in a bear barrel to keep the bears out) starts at perhaps 25 pounds and ends at 10. The canoe weighs perhaps 45 pounds. At our age, we take 2 trips on the portages. First with the packs to get the views and figure out what obstacles there might be on the trail (and for that matter figuring out where the portage goes) then another with the canoe and food. How do you know where the portages are? Guide books often give directions. 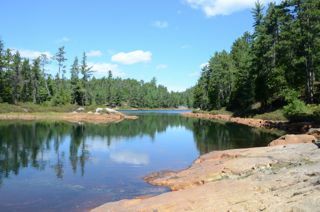 We used Hap Wilson's Temagami Canoe Routes. Occasionally a previous tripper has tied a ribbon on a tree or marked a tree. Sometimes there are small cairns marking routes over rocks. What fish do you catch? All bass. One perch. I only fish for food. 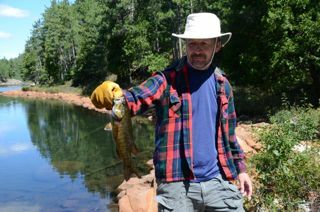 No catch and release so most days, one fish is one meal. Sometimes 2. And when dinner is caught, fishing is done. Rockbass are small but invasive so I always kill and eat them (lots of work to clean though). Did not catch a crappy but same would apply to that. I use a very cheap collapsible rod and cheap lures. Bass and perch are not very specific and will strike almost anything unlike trout which are picky and hard to catch. That's what trees and bushes are for. Let me know if there are other things I should add to the FAQ. The pictures are all from the trip. 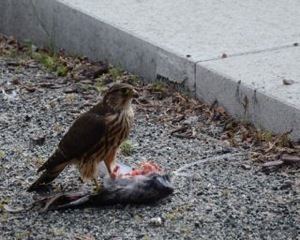 The falcon was in the town of Haliburton before the trip began. 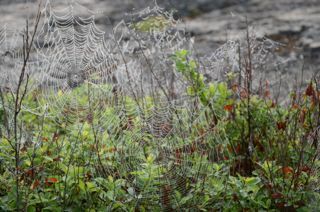 The spider web was early morning dew. The fish was lunch.